I promised that I would tell you about this pie, once I had baked it for my family’s Thanksgiving celebration. In retrospect, it was probably a dangerous promise to make: what if I had changed my mind about what to have for dessert at the last minute? Or even worse, what if the pie had turned out to be a complete disappointment? Happily, it didn’t. I’m tempted to state that it was one of the best pies I have ever made. 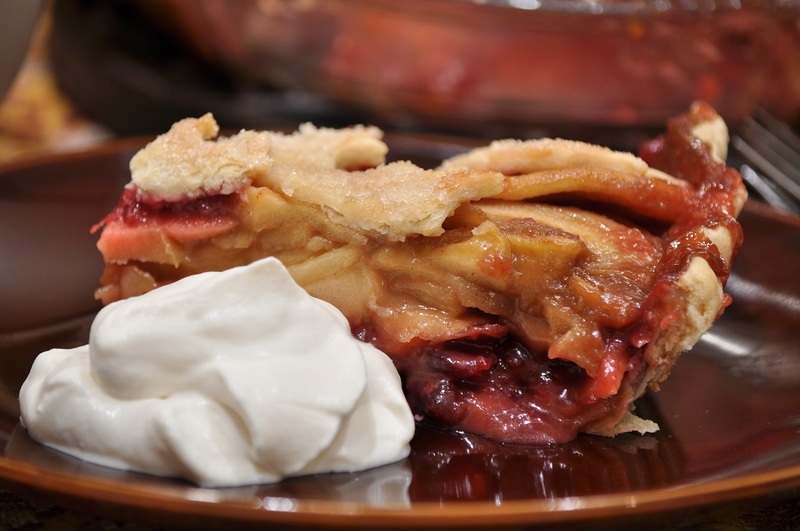 When gooey caramel-apple filling is paired with dollops of bright, tangy cranberry-cherry compote and baked all together in a flaky piecrust, the results are bound to be outstanding. I see myself making this pie frequently in the future. And you should, too. You don’t have to wait until next Thanksgiving. 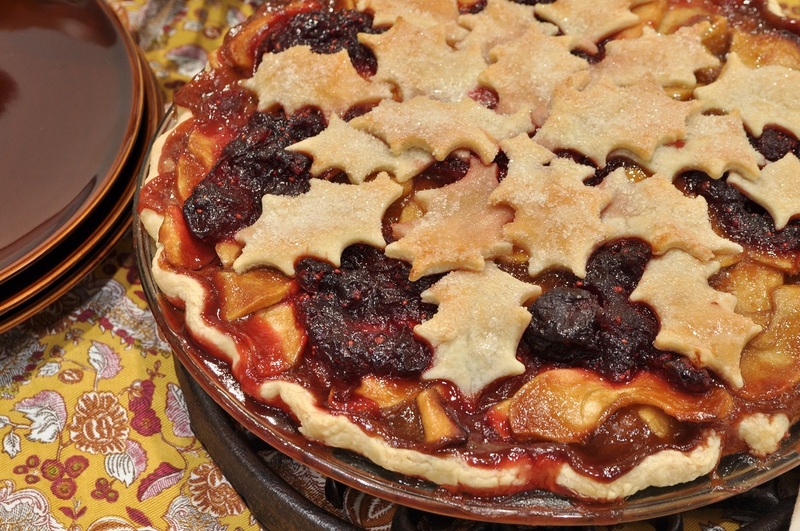 For the brilliancy of this pie is that it transitions flawlessly from autumn and harvest time to Christmas and the holiday season. It’s the cranberries that do it. I know that cranberries are part of the Thanksgiving feast, but I always associate them most strongly with Christmas. Just switch the leaf cutouts that decorate the top of the pie for snowflakes or fir trees, and no one would ever be the wiser. And of course, with the cherries, you might even stretch its lifespan a bit further, and take it all the way into February for Washington’s Birthday. I rather fancy doing that myself. I don’t want to wait a whole year before making it again. She showed the recipe to me, of course, but then she folded it up and slipped it into one of our cookbooks, and I forgot all about it. Then, when Thanksgiving was approaching, she pulled it out and suggested we make it. Better Homes and Gardens called it a Caramel Apple-Cherry Pie, but this does not do the pie justice. The cranberries ought to have received star billing, too. Fortunately, they were the first ingredient listed, so as soon as I saw them, I seconded the idea with enthusiasm. 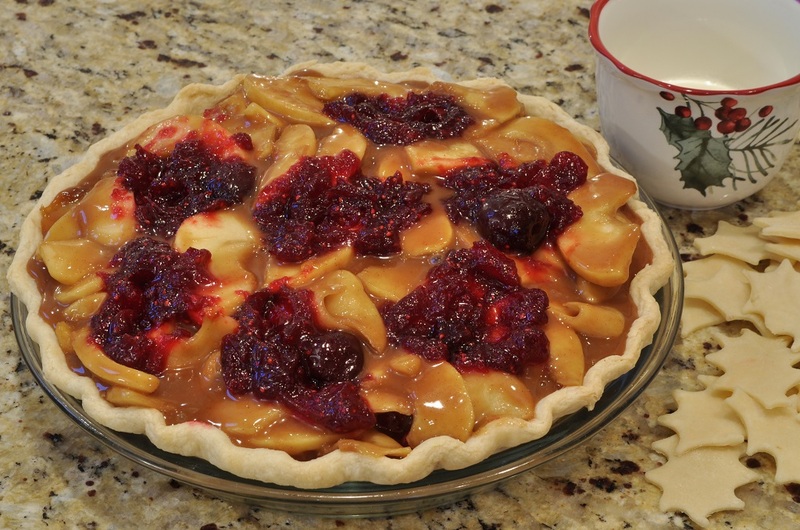 In addition to cranberries, cherries, apples, and caramel, the original recipe called for orange juice and zest in the cranberry-cherry compote, and lemon juice and zest in the apple filling. I generally love orange with cranberry, and I don’t mind a bit of citrus perk in the filling for an ordinary apple pie; but this, I decided, was too much of a good thing. Putting so many flavours together simply muddles the whole. So I scrapped all the citrus ingredients, substituting apple juice as the cooking liquid for the compote instead. I think it was the right decision: the cranberries add plenty of acidity on their own, and using apple juice helps marry the flavours of the compote with the apples, making the filling taste more cohesive. Note: In addition to omitting the citrus flavours called for in the original recipe, I also halved the cinnamon and used cream instead of egg wash to adhere the sugar to the cutouts. First, make the piecrust. Whisk the flour and salt together in a medium-sized bowl, and then cut in the cold butter, using either your fingers or a pastry cutter, until pea-sized pieces remain. Add the water and lightly toss together with a fork. Once the dough starts to come together, turn it out onto the counter and gently work it with your hands into a cohesive disc. Wrap the disc of dough in plastic wrap and transfer it to the refrigerator to chill for at least 30 minutes. 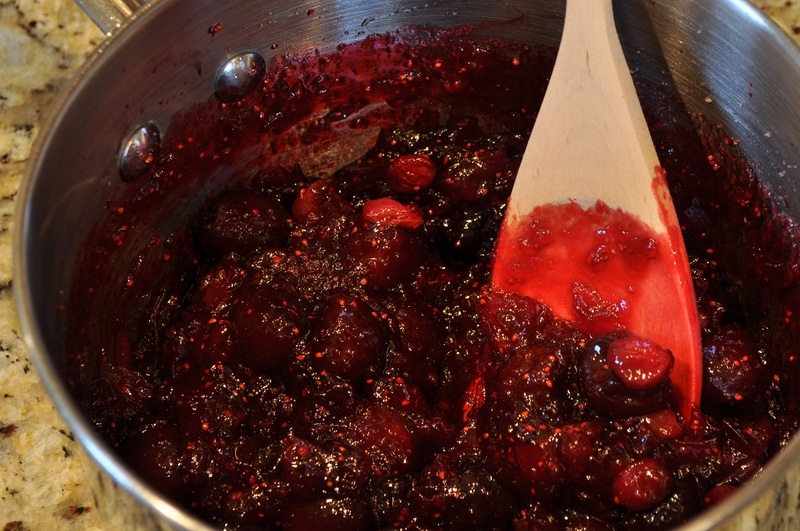 While the dough is chilling, prepare the cranberry compote. Combine the cranberries, granulated sugar, and apple juice in a small saucepan and cook over medium heat until the cranberries burst and release their juices. Continue to cook, stirring occasionally, until the mixture has thickened. Remove from the heat and stir in the cherries. Set aside to cool. Once the pie dough is chilled, cut the disc into two portions, one twice the size of the other. Return the smaller piece to the refrigerator. This will be used to make the cutouts later on. Take the larger portion and place it on a well-floured surface. Roll out into a circle about 11 inches in diameter, rotating the dough after every few passes of the rolling pin and dusting the counter with additional flour as necessary. Fold the circle in half, lift it up, and gently and quickly deposit it on one side of a 9-inch pie plate. 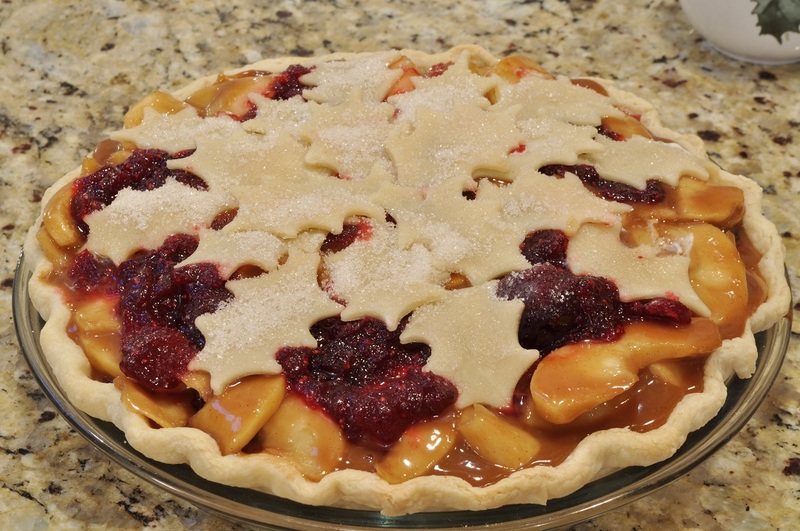 Unfold the circle of dough to cover the rest of the pie plate and carefully ease it down into the corners. Trim the excess dough half an inch from the edge of the pie plate. Fold the ½-inch overhang under the dough that is covering the rim and press the two layers together so that they stand upright along the rim. Then take the thumb and forefinger of your left hand and place them against the upturned “collar” of dough, pressing the knuckle of your right forefinger between them to crimp the edge. 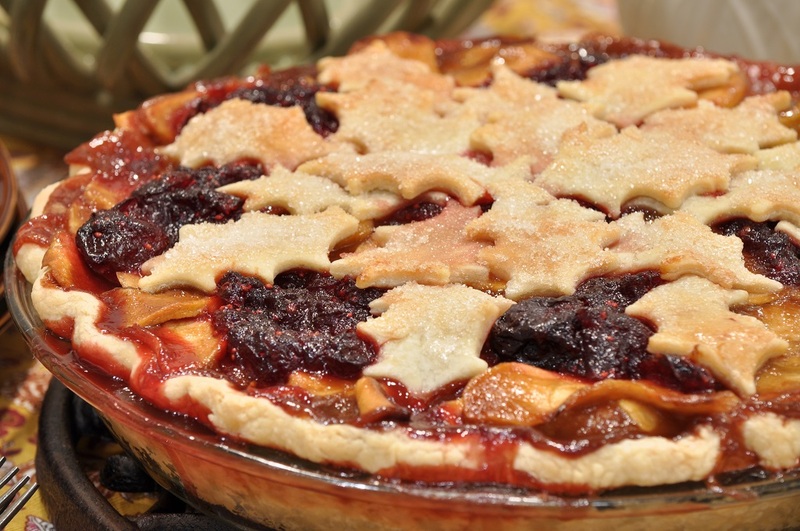 Repeat all the way around the circumference of the pie. Use a fork to prick the sides and bottom of the pastry. This will prevent it from puffing up in the oven. Transfer the prepared pie shell to the refrigerator to chill again. Preheat the oven to 375°F. While the shell is chilling, prepare the apple filling. Peel, halve, and core the apples; then slice them ¼-inch thick. You should get about 2 ¼ lbs. of sliced fruit. Place the sliced apples in a large bowl. In a small bowl, whisk together the dark brown sugar, flour, and cinnamon. Sprinkle this mixture over the apples and toss gently to coat. Melt the butter in a large pot and pour in the apple slices. Cook over medium heat, stirring frequently, until the sugar has melted, about 5 minutes. Add the heavy cream and vanilla, and continue cooking for another 5 minutes, stirring frequently. 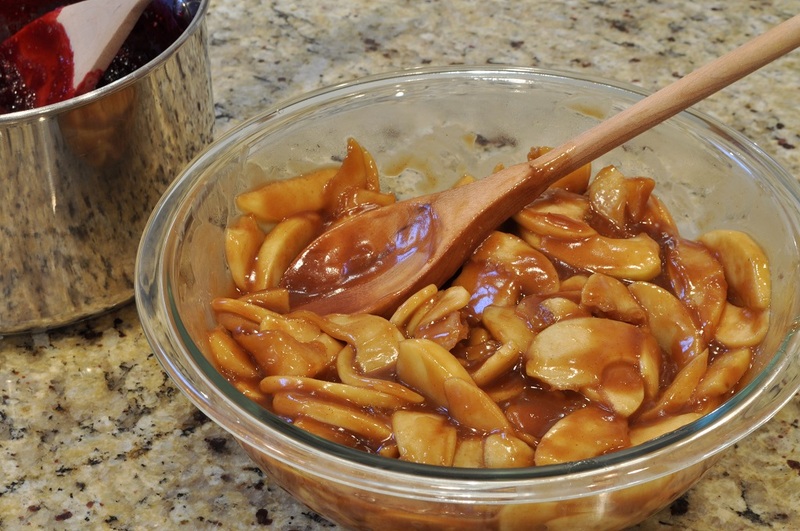 Once the juices have thickened and turned a rich caramel color, and the apple slices are becoming tender, transfer the filling to a bowl to cool. Line the chilled pie shell with parchment paper and weigh it down with dried beans or pie weights. Bake for 20 minutes. Remove the weights and parchment paper (carefully; remember, they’re hot!) and bake for another 3 or 4 minutes, until the crust is light gold. Remove to a wire rack to cool and reduce the oven temperature to 350°F. Take the remaining portion of dough from the refrigerator and place it on a well-floured surface. Roll out ⅛-inch thick and cut into decorative shapes. 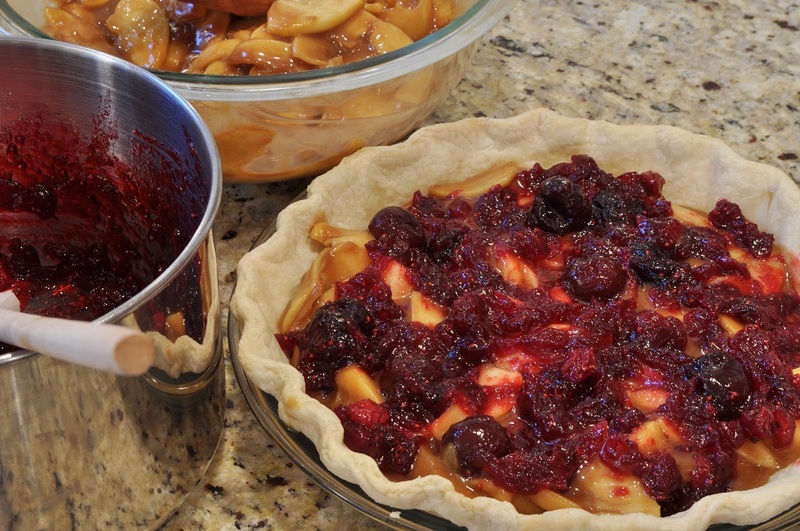 Spread one third of the cranberry compote over the bottom of the baked piecrust. Cover with half of the apple filling and then spread another third of the cranberry compote over that. Add the second half of the apple filling, and dollop the remaining cranberry compote over the top. Arrange the cutouts attractively across the filling; then brush them with cream and sprinkle with coarse sugar. Place the assembled pie on a sheet pan lined with foil (this will catch any drops of caramel that ooze over the edge) and bake for 50 to 55 minutes, or until the filling is bubbling and the crust is dark gold. If the edges begin to brown too quickly, cover them with a ring of foil during the final stage of baking. Cool several hours before serving. 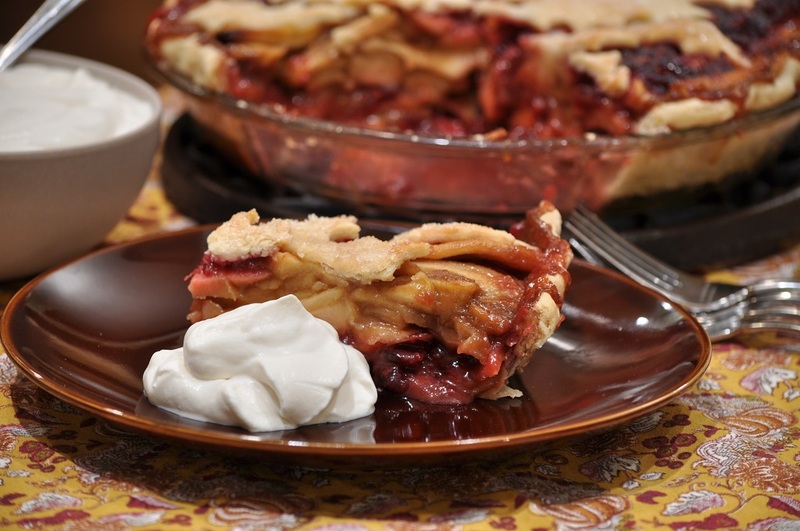 Covered, this pie will keep at room temperature for up to five days. I love that your mom photocopied the recipe at the dentist’s office! That’s kind of hilarious. 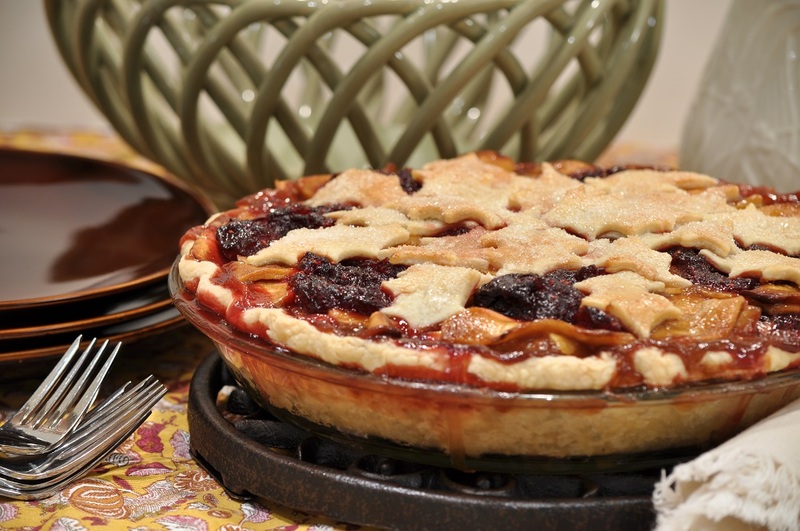 The pie looks absolutely delicious and I think the leaf details on the top are lovely. Thank you, Rebecca. That dentist office will always be my favorite in the world, thanks to their cooperation!